Dave's presentation contains insights and information resources that will help the beginner and most experienced person with ML and analytics. 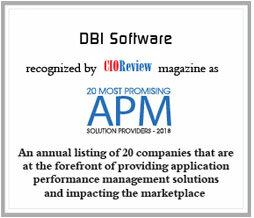 We're honored to be recognized by CIO Review Magazine as a Top 20 APM Solution Provider for 2018. Click the image at right to read the short article that CIO Review published! And, remember to visit DBI's EVENTS page for the latest information on upcoming webinars and conferences! To download a recorded replay of Episode z93 in WMV format, right click on the link below and choose "Save As..."
Dave has graciously made the PDF of Episode z93 available; right click on the link below and choose "Save As..."